Road Rugs. 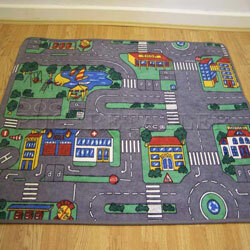 Complete your children's room with a road rug. Road rugs offer a perfect play surface for your child and there cars, not only are road rugs a play surface, they also add warmth and comfort to your child's room. Road rugs are made in the E.U. the pile is easy clean polypropylene and the backing is anti slip foam.